Accommodation, lodging in particular, is the important thing to notice before you go somewhere else for vacation. Thanks to hotel booking websites, lodging isn’t a problem anymore since we can book for a hotel online so we don’t have to be a nomad. But these days, people tend to prefer staying at other type of lodging (outside hotel) when they want to make vacation trip. Especially if experience become their concern. Airbnb is often becomes the first option for those who want to book for a non-hotel lodging. As you have probably known, Airbnb is an online marketplace which enables people who have unused rooms on their house to rent them out. Although you will probably can also find a hotel room in Airbnb, but the focuses of this service to provide a non-hotel lodging like villa, homestay, hostel and so on. The question is, what if you can’t find a suitable lodging on Airbnb, while you reluctant to stay at hotel? Is there an alternative to Airbnb? The quick answer is, yes there is. Although Airbnb is so popular, it is basically not the only vacation rental website in the market. Below is the list of vacation rental websites like Airbnb you can use to book for lodging. The first Airbnb-like wesbite you can use to search and book for lodging is VRBO, which stands for Vacation Rental By Owner. Currently, there are about 2 millions lodgings worldwide available on this website, making your opportunity to find a suitable lodging getting higher. The interface of VRBO is pretty handy, not far different to Airbnb where there is a search box in the middle of its site to makes it easy searching for lodging. Just input the location you want to go to and you can filter the search results by price, lodging type, and bedroom as well. If you click a certain lodging from the search results page, you will be taken to the detail page of the lodging, including map, amenities, reviews from the users, photos and so on. VRBO also allows you to contact the lodging owner, which will be sent to her/his email. VRBO itself is owned by HomeAway, Inc, a company behind HomeAway.com, another rental vacation website. VRBO was acquired by HomeAway, Inc in 2006. With more than 200 countries currently available, TripAdvisor Vacation Rentals is also a nice website to find the best non-hotel lodging. Most people probably know TripAdvisor as a website where they can read reviews of places like restaurant and tourist attraction. Well, TripAdvisor actually also allows you to search and book for lodging. 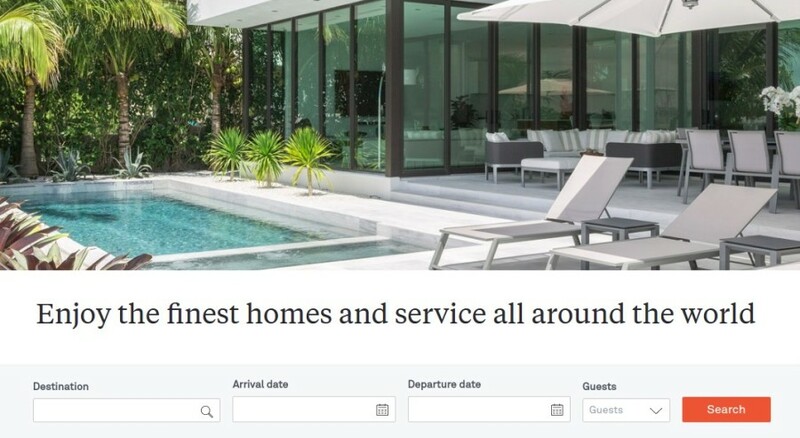 The main interface of TripAdvisor Vacation Rentals is not far different to similar websites, including Airbnb and VRBO with a search box lied on the middle of the site. But, this site comes with richer filter options. Other advantage of TripAdvisor Vacation Rentals is it supports plenty of local currencies so that you can guessing how much the lodging price if converted to your currency. 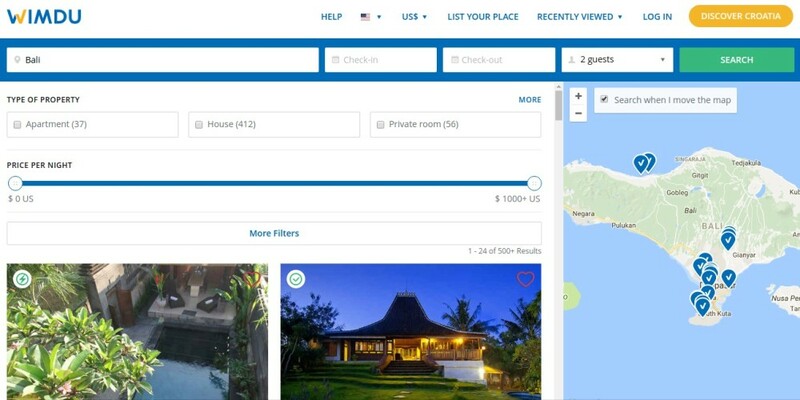 In an attempt to enrich its search results page, Tripping.com is teaming up with similar services like VRBO, HomeAway to TripAdvisor. The result is not too bad. Since Tripping.com also displays listings from other sites, you will see more search results for a certain query. Tripping.com itself is better suited to be called a vacation rental search engine. The fact, Tripping.com stated itself as the world’s largest search engine for rentals. Tripping.com also allows you to filter the search results by several options, including price, amenities, lodging type and so on. FlipKey is a vacation rental website subsidiary of TripAdvisor. Compared to its parent company, FlipKey has smaller number of listings. In 2016, FlipKey listed more than 300,000 properties in 179 countries. All rental owners who want to list their properties to FlipKey will be verified first by FlipKey staffs. In addition, the company also use the traveler reviews as the consideration. Each item on the search results page contains TripAdvisor rating and reviews as well. If you deeply trust TripAdvisor, they (the rating and reviews) will be useful to pick the best lodging. 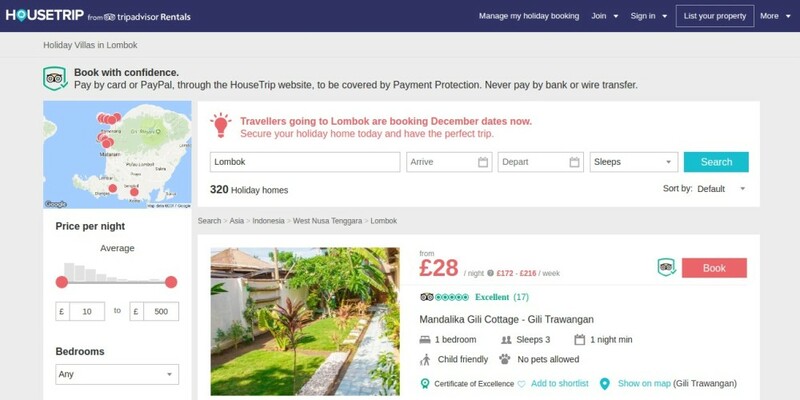 HouseTrip is another vacation rental that allows you to search and book for non-hotel lodging. This site also has a considerable listed properties. As of June 2014, there were more than 330,000 property listings on HouseTrip. Now with the fact that it was acquired by TripAdvisor, you can also read the reviews from the TripAdvisor users directly on the detail page of each property you choose. HouseTrip also allows you to filter the search results page to narrow the list based on your criteria. Best of all, HouseTrip accepts PayPal as the payment method. Wimdu is considered as one of the serious competitors of Airbnb. At the time of writing, there are about 350,000 lodgings, which vary from apartments to homes, available on Wimdu. Those lodgings are located in 150 different countries across the globe. 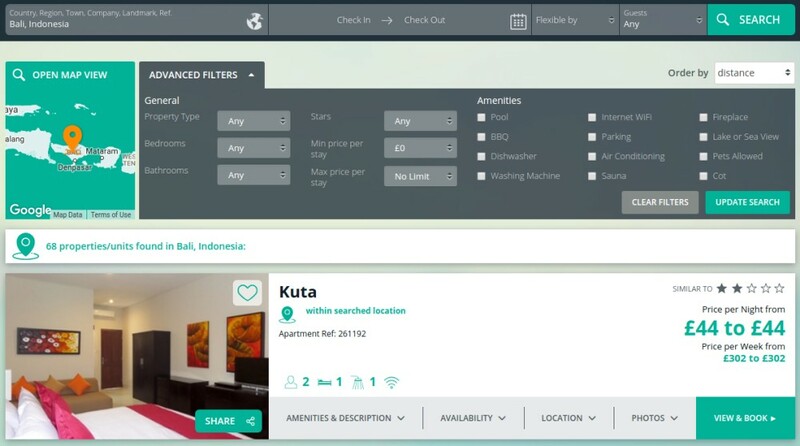 Wimdu also comes with an easy-to-use interface to makes it easy for users to search and book for lodging. The search results page can also be filtered based on your criteria. Same as all websites above, if you click certain lodging from the search results page, you will also be taken to the detail page of each lodging, providing detailed information about the lodge. Furthermore, Wimdu also accepts PayPal. Just like all websites mentioned earlier above, Homestay also allows you to search and book for lodging for a vacation need. Most lodgings that are rent on this site are apartments and houses, although you will probably also find other type of lodging. The search results page of Homestay can also be filtered to display the best possible results based on your preferred criteria. Furthermore, Homestay also support a number of local currencies. There is no exact information of how many properties have been listed to Homestay, but since the reach of Homestay is also global so that you can use this website to find lodging in a certain country in case you want to make a holiday abroad. Currently, hosts from 160 different countries have listed their properties to Homestay, for rent. Rentals Combined is a London based vacation rental website that you can use as the alternative to Airbnb. This website also has a global reach so that you can use it as a finder of lodging accommodation if you want to make holiday abroad. The website claims it has 670,000 rental properties worldwide. In general, the features offered by Rentals Combined are not far different to other websites above. You can also use the filter tool to narrow the choice, as well as adjust the currency to your local currency. Onefinestay tends to suit for travelers with high travel budget. All of the lodgings that are rent on this website cost at least $100 per night. The website indeed focuses on luxury vacation rental apartments and homes. Speaking of feature, Onefinestay is basically not far different to all websites above. You can also filter the search results based on your preferred criteria. But again, this website focuses on high priced lodgings. The minimum price you can set if you want to filter the search results by price, is $100. Same as Rentals Combined, Onefinestay also headquartered in London, England. 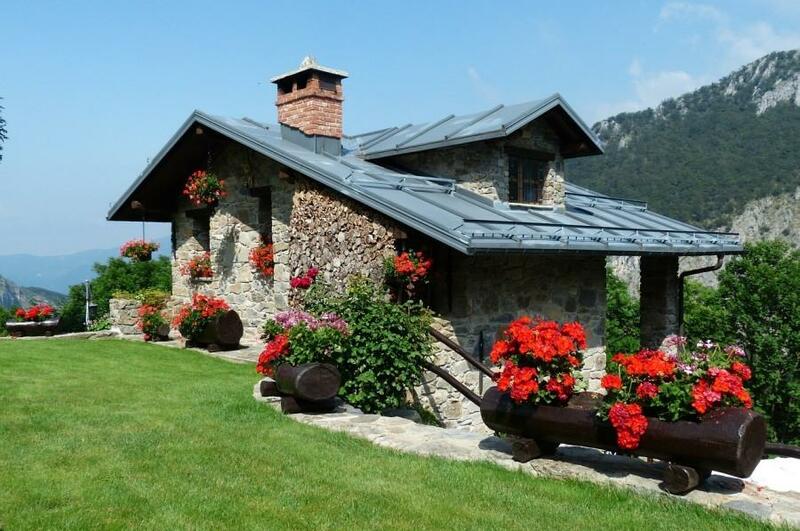 Another vacation rental you can use to search for lodging accommodation is Bedycasa. This website also doesn’t provide exact information regarding the properties listed on its site, but one thing for sure, you can use Bedycasa to search for lodging rental in several countries worldwide. In opposite to Onefinestay, you can use Bedycasa to find a lower priced lodgings. Properties that are rent on Bedycasa ranged from $10 – $300 per night. But, it only apply for a single person. At the time of writing, Bedycasa only supports three currencies, USD, EUR and GBP.